If you are fortunate enough to own or be renting a property that has enough space and large enough bathrooms to fit a double vanity unit in to it, then I highly recommend that you do just that and go through the time, effort and expense to rip out the current bathroom wash basin unit that you have in your bathroom or perhaps bathrooms and find yourself a stunning double basin vanity unit that perfectly fits with yours and if you have one, your partners taste. 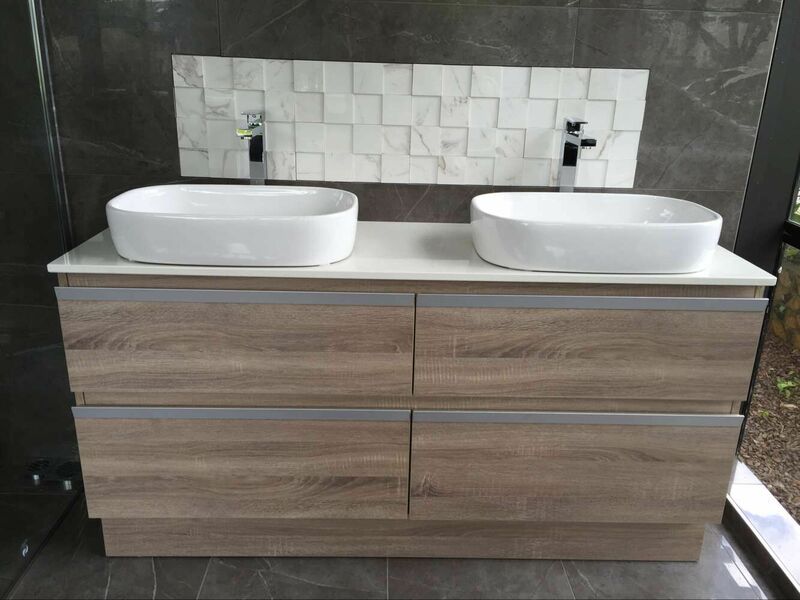 There are many benefits that will come with fitting your bathroom with a double basin vanity unit, so the extra cost is certainly worth it in my opinion and I am very confident that you will have the same opinion after fitting one, that is, if you don’t already agree with me. With two basins fitted to your bathroom vanity unit, you can finally put an end to any arguments that you may have been having with your partner about who can brush their teeth, shave, do their make-up – ie; use the bathroom first. Instead you can both simultaneously use the bathroom basins together and maybe enjoy each other’s company while you do, you might find it is a great place to catch up with each other over the day’s events. It certainly has done wonders for my relationship and maybe it will do the same for yours. Another benefit of the two basin units is that it allows you to be using one for soaking some clothes or washing something, or just something other than the normal daily bathroom basin usage, while you keep the other available for the usual face washing, teeth brushing and anything else you need to use it for on the daily. Before we had the double basin unit, I used to come to brush my teeth in the evening only to find that my partner had filled up the sink with water in preparation for something else she had planned and this was always another potential risk of an argument which you just don’t need, last thing at night just before bed – so get a double basin unit and forget about any potential argument risks just like this. Having a large vanity unit with double bathroom basins also means that you have a much larger worktop surface, which is the perfect place to store a number of toiletries that you would have otherwise been forced to store away in a cabinet or drawer, or some kind of shelving you might have fitted or purchased for your bathroom. If you have enough of a budget, you can also choose to invest in something luxurious like a Marble or Quartz, or perhaps Onyx topped double basin vanity unit, which look absolutely amazing and can really bring a bathroom to life. This will bring more of a sense of pride to your home and is a great way to start and finish each day, enjoying to talk into your stunning, luxury styled bathroom that will bring a sense of confidence to your personality. With the large vanity unit, also comes a lot more storage space within it, so not only do you have the vast amount more work surface space, but you also have a huge amount of space inside the unit – most will come with drawers and cupboard space. So you can comfortably fit in and store all your bathroom necessities, like bathroom towels, razors, hairdryers, hair clippers, straighteners and the rest. This extra storage space can be a real problem solver and means that you are kind of killing two birds with one stone – you needn’t invest in a bathroom vanity unit and then a storage unit as you have everything you need all in the one large double basin vanity unit. I am sure you can maybe think of other benefits? I am sure I could if I spent some more time thinking about it, but I hope that the reasons I have provided above are sufficient in persuading you that it makes sense that you purchase and fit a double basin vanity unit into your bathroom if you have enough space in it to fit one. « Do You Have Enough Storage Space in Your Bathroom?